As beauty trends come and go, it's safe to say that some personal desires in our beauty routines never change. If you've been following my journey for a few years, it'll come as no surprise to you that I'm always on the look out for products to achieve bright luminous skin. 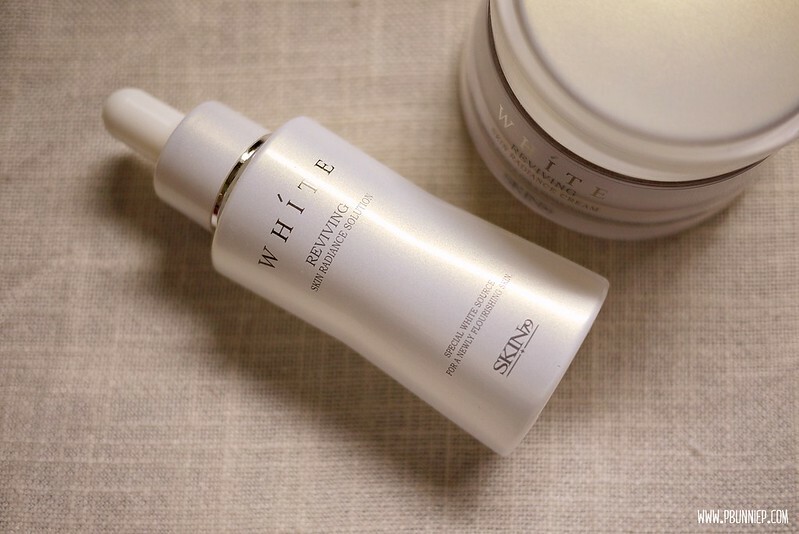 You may remember my first introduction to Skin79's skincare range with the White Reviving Skin Radiance Cream (reviewed) and since then I had been eager to try more from the line. 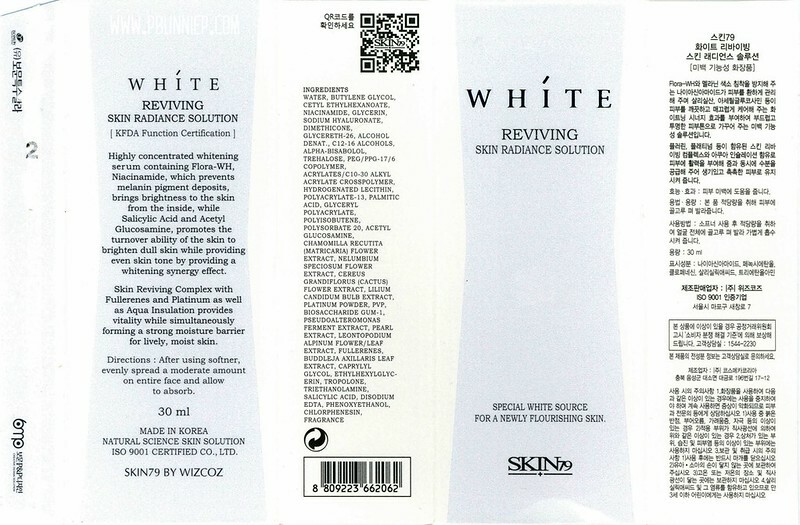 Let's begin with what I was looking for when I made the order for the White Reviving Solution (and a repurchase of the cream) because I think that initial expectation had much to do with how I reacted to it's performance. Upon finishing up my Hadalabo this during late winter, I had gotten the White Reviving range to ease my way into the spring weather. While I loved the soft and luminizing quality of the cream, I did find it lacking in moisture for the colder season and hoped that with the addition of the Solution, it would not only add further hydration but also intensify the overall skin brightening effect. Not to mention I loved concept of a mineral oil free, paraben free and pigment free formulation. While the term "Solution" might be a little confusing in Western skincare vocabulary, its function is akin to that of a serum or essence and that is exactly how I used it, after cleansing and before moisturizing. The bottle is a heavy glass dropper dispenser, which I must admit is quite chic but from also from a functional perspective, this allows you to apply the perfect amount of product as needed. Carrying a light ever so slight floral fragrance, this had a milky look to it and a very fluid consistency that felt refreshing to use. With in a few seconds, all that remains is a silky soft feeling on the skin with absolutely no residue which is perfect to use for layering with other products (as Korean skincare tends to favour this method). Coupled with the White Reviving Cream, my skin felt immediately soothed and gently moisturized, there was no sensitivity or stinging even when used over broken skin, in fact this was great at calming any localized redness on my face. My skin felt nourished and refreshed with a slight brightened glow which was especially nice during dull rainy mornings. Disappointingly for me however, was the fact that the Solution did not add much additional moisture to my skin, despite it containing sodium hyaluronate as one of its main ingredients (see packaging below). While it was borderline sufficient during the transitional periods from winter to spring, I much preferred something heavier especially during night time. In the end, I had to partner this up with my Hadalabo moisturizing toner and a few drops of facial oil to gutsy it up during the evenings though perhaps if I had used the entire line (with its toner and emulsion) then I may not have required this. Curiously, on some mornings I found areas of my face to a tad flakey, with small patches of dead skin floating on the surface and just begging to be sloughed off. Might this be the "cell turnover" effect by the salicylic acid and acetyl glucosamine? Perhaps, though I can't be certain. Over the months, I did find that this did help to lessen the leftover marks from a breakout or spot faster than usual and helped to maintain an even complexion overall during the winter. 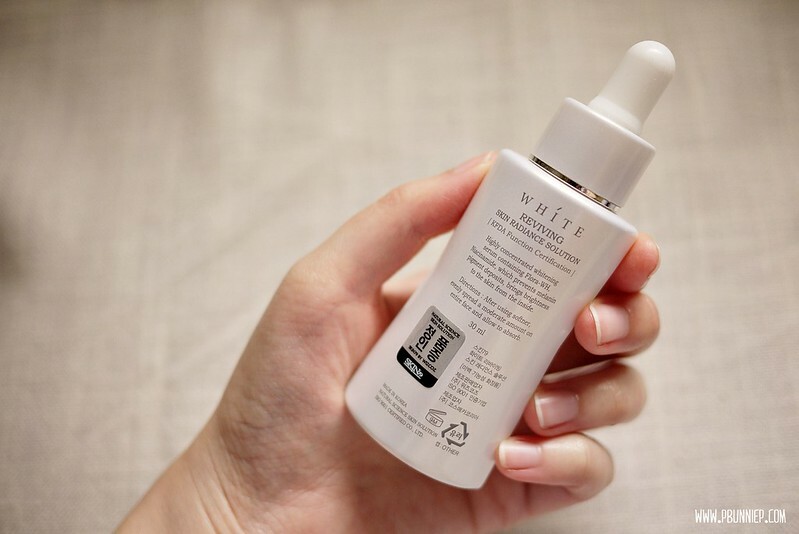 Now I wouldn't say that the results were dramatic, nor would I say that this is a quick fix solution to hyper-pigmentation but for those with reasonably clear skin wanting something gentle to keep their skin bright this might be something to try out. This is also a great option for anyone with combination dry/oily and sensitive skin who is afraid of burdening their skin with heavy products, both the solution and the cream are excellent in texture. Personally, I would reserve this for the summer season as this just wasn't perfect enough for my easily dehydrated winter skin and couldn't hold up on its own without additional products. 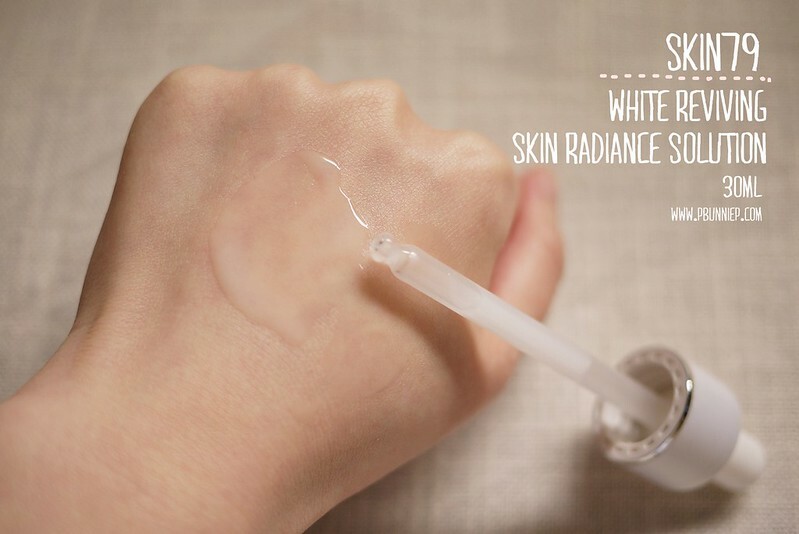 you should try the Caudalie Vinoperfect Radiance Serum!